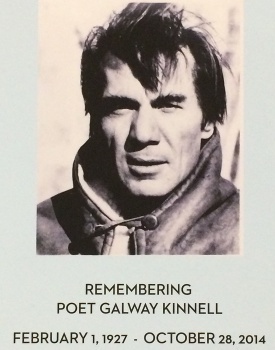 A new exhibition in Rush Rhees Library highlights the work of Pulitzer Prize-winning poet and University of Rochester alumnus, Galway Kinnell, who died October 28. Kinnell earned a master’s degree in English at the University of Rochester and frequently returned to campus as a reader at the Plutzik Poetry Reading Series. The exhibition is designed to remember Kinnell’s association with Rochester over the years, beginning with his master’s thesis, “The Bridge” of Hart Crane: A Poetic Affirmation in the Twentieth Century (1949). Items on display also include his 1981 interview for Rochester Review (“Writing Poems: The Thrill of Discovery”), his 1982 Plutzik Poetry Series reading, and his 2001 University of Rochester commencement address, during which he received the Hutchison Medal. Several Kinnell poetry collections and five full-text poems are also on display, along with a paragraph response by then-undergraduate Kirk Chilas, UR '11, to a reading of Kinnell’s The Book of Nightmares. Kinnell was the author of ten books of poetry, a novel, and a children’s book. His Selected Poems won the Pulitzer Prize and the National Book Award in 1982. He served as a Chancellor of The Academy of American Poets and was awarded the Frost Medal by the Poetry Society of America in 2002.